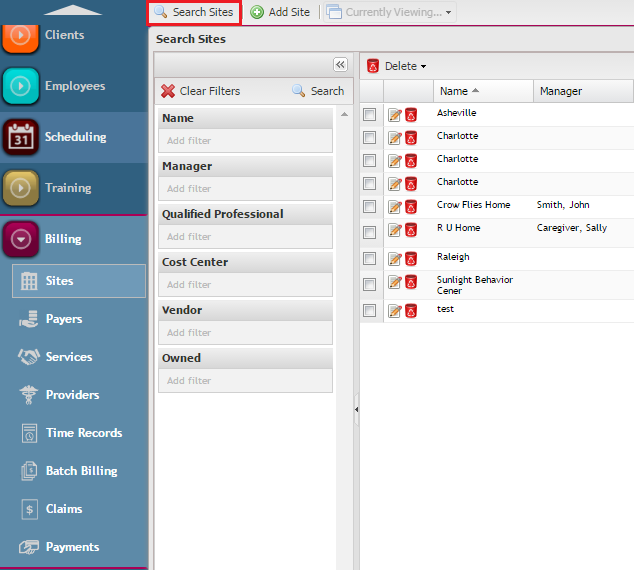 The Sites desktop is where company billing/site information is entered in OnTarget. This is where the provider’s site address (and other identifying information) are entered according to what is on file with the payers(s). In order to search for Sites, click on “Search Sites”. This populates a search grid with various filters that can help in searching. Filters are available for Site Name, Manger, Qualified Professional, Cost Center, Vendor, and Ownership status. Click on “Add Site” to add a site. This opens the site configuration window. First, enter a Site Name. This should be a name that is easily identifiable as a site/billing address since you will select this site name from a drop-down list when entering service authorizations in OnTarget. Next, enter the Address including the City, State, and Zip. This should be entered exactly as the address that the corresponding payer has on file. Complete the remaining general site information if necessary to include County, Email, Phone, and Fax. Click Save. 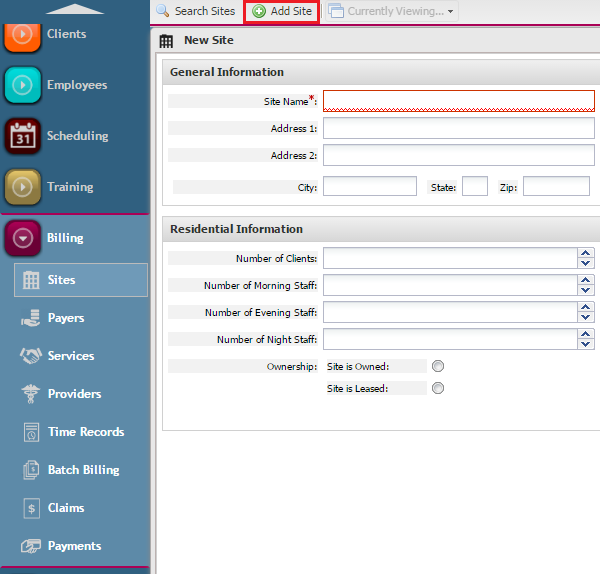 Once you have saved the general site information, a “Provider Assignments” section will populate. This is where you assign providers and corresponding payers. First, select the Provider from the drop-down. If you have not configured providers, please see the Providers setup section of help. Next, select the corresponding Payer from the drop-down. If you have not configured payers, please see the Payers setup section of help. 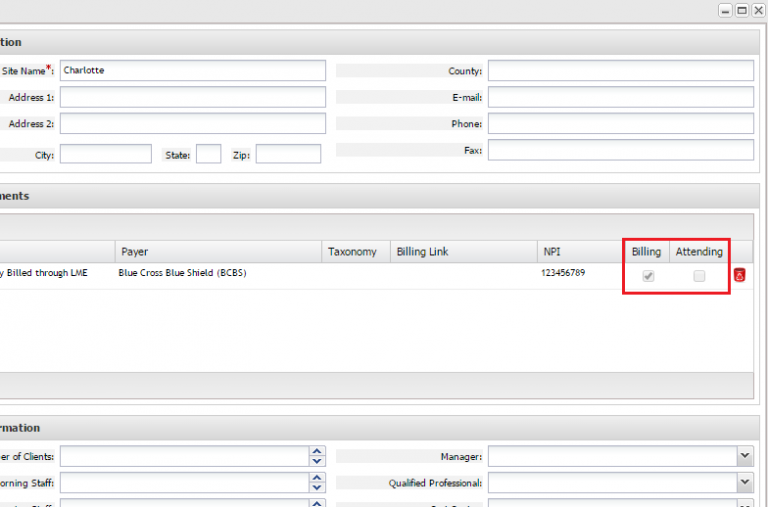 Billing Link is typically a number/code that is established in claims submission software. Enter that number if available. 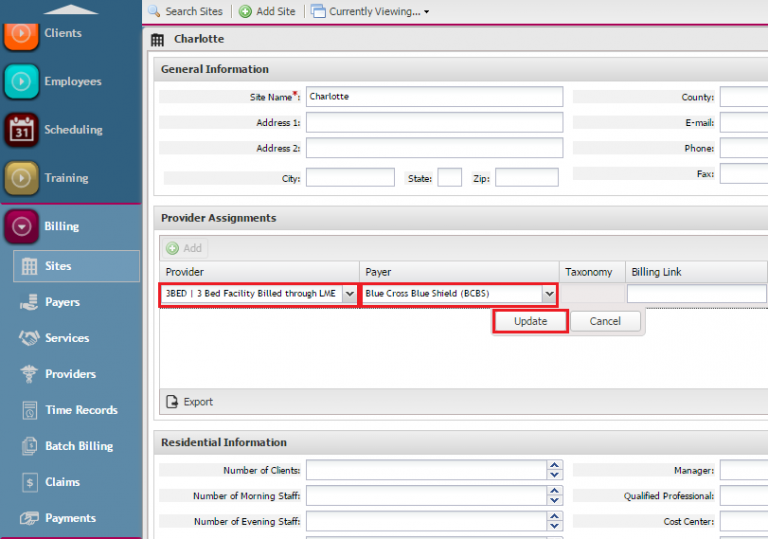 Next, select either the Billing or Attending checkbox, depending on whether the provider assignment will use a billing npi, or an attending npi (typically based on the service being provided). Save the site information. If this site is a residential facility, there is a section for Residential Information. 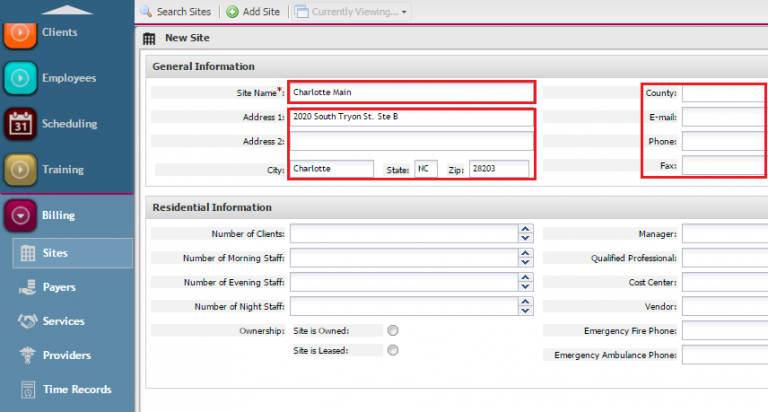 This section includes data fields for client and staff information and related manager, QP, cost center, and emergency information.